If you want to rest assured that the Summit Treestands SU81119 is going to be fully capable of handling both your body weight and that of your hunting gear, you needn’t worry about anything. This product is made to last, it’s convenient and easy to use, and most of all, it is capable of supporting as much as 350 pounds of weight, which makes it one of the most reliable alternatives in its class. Its construction is also durable, which means you won’t have to replace it ahead of time. Besides, it is equipped with most of the safety features you might want to see in such a product. Let’s look at what makes it stand out from the crowd so that you understand whether it’s a good choice for you or not. The Goliath SD has one of the biggest platforms on the market today since it measures 20 by 26.5 inches. What this means is that big guys have a lot more maneuverability as well as clearance and that they can handle their weapon comfortably and conveniently, therefore making a clean kill way more often. As for the construction of this product, you’ll be glad to know that it is crafted from aluminum, which means that it is capable of holding your weight but it’s not overly heavy. If it were to be made from steel, you’d undoubtedly find it a bit challenging to carry around. It weighs a little more than 21 pounds, but that certainly seems a reasonable trade-off given the fact that it can securely hold you and your equipment. Its lightweight design is one of the features that recommend it. It’s highly portable, so you can just grab it and install it in another tree if you’re under the feeling that the vantage point you’ve used until now is no longer effective. Now that we have established that this is a reliable tree stand we’re tackling, let’s look at some of the features that make this product unique compared to its competitors, especially in terms of design. First off, this one comes in a camo design, so it can seamlessly integrate into the hunting environment, allowing you to benefit from excellent stealth. While you might argue that this feature could be unnecessary given that you’ll on a higher plane than your targets, you’re not invisible from a distance. The bigger frame that the Goliath has been equipped with gives you enough room and plenty of opportunity to benefit from its strength, rigidity and sturdiness. It measures 21.75 by 26.5 inches, so it’s even bigger than its older family member, the Viper. When it comes to portability, this product is a net winner since it is outfitted with backpack straps that allow you to carry it conveniently and effectively. The Goliath SD comes with RapidClimb Stirrups and the Summit Lokt, much like many of the other models made by this particular brand. It’s quite easy to set up, at least based on the feedback that we have come across in this sense, but we do have to make a note regarding the instruction manual since there have been complaints about it not being very clear. As such, you’ll require some time to get used to it. 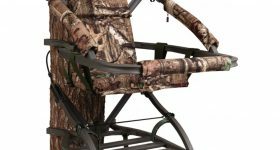 The unit comes with a backrest, as well as a suspended foam-padded seat that will enable you to remain comfortable all throughout an entire hunting day. 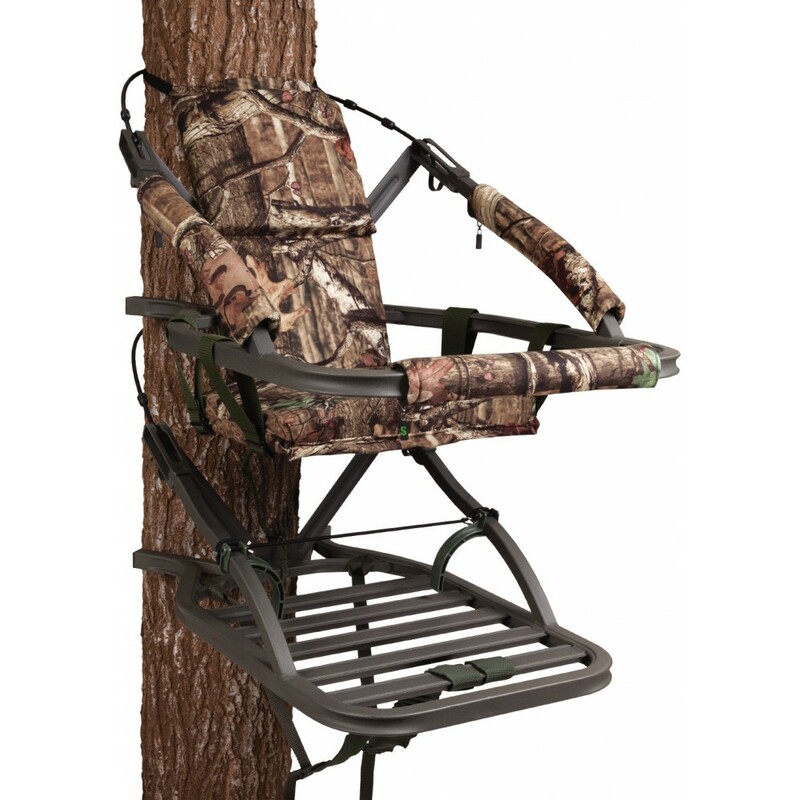 With most other tree stands, you have to manage an inconvenience as best as possible and it consists of the fact that they tend to make a lot of noise as you stretch or change your body position once you’ve been sitting in it for several hours. You won’t have to worry about losing your stealth and inaudibility with this model, though, since it boasts Summit’s DeadMetal Sound Deadening Technology. There are critical parts of the stand where metal could have come in contact with metal, and these have been filled with expanding foam. As such, this is one of the quietest units in its class. Naturally, noise reduction plays an important part in keeping you concealed.